Researchers trying to make high-capacity DVDs, as well as more-powerful computer chips and higher-resolution optical microscopes, have for years run up against the “diffraction limit.” The laws of physics dictate that the lenses used to direct light beams cannot focus them onto a spot whose diameter is less than half the light’s wavelength. Physicists have been able to get around the diffraction limit in the lab–but the systems they’ve devised have been too fragile and complicated for practical use. Now Harvard University electrical engineers led by Kenneth Crozier and Federico Capasso have discovered a simple process that could bring the benefits of tightly focused light beams to commercial applications. By adding nanoscale “optical antennas” to a commercially available laser, Crozier­ and Capasso have focused infrared light onto a spot just 40 nanometers wide–one-­twentieth the light’s wavelength. Such optical antennas could one day make possible DVD-like discs that store 3.6 terabytes of data–the equivalent of more than 750 of today’s 4.7-gigabyte recordable DVDs. Crozier and Capasso build their device by first depositing an insulating layer onto the light-emitting edge of the laser. Then they add a layer of gold. They carve away most of the gold, leaving two rectangles of only 130 by 50 nano­meters, with a 30-­nanometer gap between them. These form an antenna. When light from the laser strikes the rectangles, the antenna has what Capasso calls a “lightning­-rod effect”: an intense electrical field forms in the gap, concentrating the laser’s light onto a spot the same width as the gap. “The antenna doesn’t impose design constraints on the laser,” Capasso says, because it can be added to off-the-shelf semiconductor lasers, commonly used in CD drives. The team has already demonstrated the antennas with several types of lasers, each producing a different wavelength of light. The researchers­ have discussed the technology with storage-device companies Seagate and Hitachi Global Storage Technologies. Another application could be in photo­lithography, says ­Gordon Kino, professor emeritus of electrical engineering at Stanford University. This is the method typically used to make silicon chips, but the lasers that carve out ever-smaller features on silicon are also constrained by the diffraction limit. Electron-beam lithography, the technique that currently allows for the smallest chip features, requires a large machine that costs millions of dollars and is too slow to be used in mass production. “This is a hell of a lot simpler,” says Kino of Crozier and Capasso’s technique, which relies on a laser that costs about $50. But before the antennas can be used for lithography, the engineers will need to make them even smaller: the size of the antennas must be tailored to the wavelength of the light they focus. Crozier­ and Capasso’s experiments have used infrared lasers, and photo­lithography relies on shorter-wavelength ultraviolet light. In order to inscribe circuitry on microchips, the researchers must create antennas just 50 nanometers long. Capasso and Crozier’s optical antennas could have far-reaching and un­predictable implications, from superdense optical storage to ­superhigh-resolution optical microscopes. Enabling engineers to simply and cheaply break the diffraction limit has made the many applications that rely on light shine that much brighter. Forgive me for directing this brilliant work towards destructive uses but I wonder what implications this research might have for laser based weaponry being that such weaponry relies on localized super-heating; a tight enough beam that could deliver enough power to a single point is just what effective laser weapons are missing. The large near field enhancements caused by the nanoparticles are localized to the area between them. There is no propagaing light. This means that any weapon using such technology would have a maximum range of about 20 to 50 nanometers. Laser guns with enough heating capability are possible. The truth is the opposite: Lasers with that much power used in a non-vacuum environment cause the "blooming effect", which is, simplyfing, the super-heating of air changing it into plasma. That causes the laser to disperse much of its power and focus in a couple of metres range. kind of like a laser-shotgun type weapon with incredibly low range? Approximately how long before we start seeing DVD's of the size mentioned or any of the other improvements from this technology available for purchase? Likely Overly Optimistic - the Scientists have limted data recording expertise, despite their renown... Peer review failed. A certain near field recording venture in late 90s failed technically due to excessive field intensity at the surface of the recording medium, causing ablative effects (surface damage) on the suface recording layer. The technical lesson of this is that any useful near field recording technique must avoid any operating condition which results in a poorly heat sunk recording layer (ie surface recoding layer) as a recording strategy. The prior effort would have succeeded technically had the team used a little known film coating process and material that buried the recording layer 0.5um or more below the surface (ideally a few microns) and designed the SIL (solid immersion lens) contact near field optical recording head to focus sub surface, still at advantage over air gap optical recording methods. Where is the significance here? 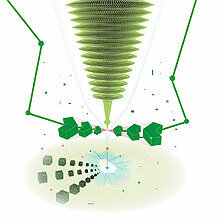 Tiny holes on emitting laser facets that leverage plasmonic effects (unstated in your short post) can only do actual surface recording, and not sub surface to any degree as the intensity drops of significantly when at optical depths that are larger than the characteristic plasmonic decay distance - approximately equal to the size of the aperture times some tiny multiple thereof. So the described laser emitting structure will end up having to write to a fragile surface layer and will likely suffer the artifact that killed a prior major effort in contact near field recording using a SIL - solid immmersion lens. Therefore, while the physics is trendy (plasmonics is hot- yes the pun is intended), the device is likely to damage any possible media layer by ablative effects not properly inhibited by a decent thickness top layer. Nevermind the propoesity of the tint aperture to have tribology / wear limitations in practical rotating media contact recording use. 2 counts - almost a strikeout. The older SIL method could have modified the focal point to be subsurface, focal point buried in a decent thickness crack free optical low loss layer(that the older startup was unfamiliar with this film at the time of the venture now closed, but the film technology has common application in an everyday device - not in data storage, but where wear reduction is an issue). So while on the surface of this technology - it seems cool, it is silly & likely not to succeed in a real commercial grade data storage device, since any useful protective layer that limits thermal ablation of the media, with be far thicker in the minimum case than the tiny plasmonic emission spot can focus to in depth below the contact surface. NIX this baby quick, as certainly it is NOT promising for rotating media data storage, even if it a cool nano science project.